Where is "that place?" Gennesaret, on the shore of the Sea of Galilee. Jesus is in the early stages of his ministry, and he is teaching in his own proverbial back yard. Where he goes, he deals with local people in contexts with which he is familiar. Accents, culture, way of being are all relatively familiar. The notion of someone being "other," while not unusual at all in this place that is the crossroads between East and West, is not expected around him. He is a remarkable, local phenomenon whose renown has spread just far enough to have people from the "big city" in Jerusalem take notice. Granted, more from what John the Baptizer and his disciples are saying about him, but all the same. So, he engages the cosmopolitan Pharisees toe-to-toe on a matter of doctrine and rabbinic traditions around the washing of hands. The deeper question he poses is "what is clean?" Is it what God has made with intent, or what we determine by our interpretations of the Law and the traditions around it? The lesson taught to the disciples is a frank warning to all of us who worry about being worthy enough of God and of each other. Taking the Pharisees' question about how many times and when to wash hands (and the fact that Jesus seems to NOT be teaching a stringent enough practice! ), Jesus reshapes it into a deeper question: How do we determine who is "in" and who is "out?" How do we know IF we are in, or if WE are out? His teaching is that there is NOTHING in God's creation that is "bad" or "unclean." Nothing God has done can pollute. It is only what comes out of us and goes into the sewer AFTER we eat...that is what pollutes. Granted, this does not admit the dietary restrictions of the Torah, but set that aside for a moment as Jesus does. When questions by the disciples, he takes them aside and, perhaps while laying a hand on Peter's chest, tells them that the heart (and its intent) does more to pollute the world than any thing that is "unclean." It is our own distinctions, prejudices and preferential discriminations that forge the pollution he is taking about. This is a hard teaching, because Jesus asks each of his disciples, and us, to look honestly at ourselves in order to willingly engage with our own, inner bits of less-than-clean. God is not there to approve how clean our fingernails are...and clean hands do not mean a righteous heart. We are challenged by a teaching that reaches deeper into us than we anticipate. We are opened up to realize that our expectations are less malleable and more crystalline that we had supposed; and Jesus is offering to us a way to see and perceive that what we presume to be the "in" might not be that at all, because it means that once we are "in" there is someone who is "out." ...and that is when the Canaanite woman approaches. From the regions to the North, the area controlled by the cities of Tyre and Sidon, a woman approaches the disciples and Jesus while seeking his aid. Her daughter is sick, and she has heard that this teacher is also a great healer. "Please!" she begs, "My daughter!" She is a stranger woman among strange men. A gentile should not be talking to a rabbi. A foreigner should not be seeking his touch. She is "other" as other gets for them, and Jesus also seems to be of that mind. Why? Because he pays her no attention. They take their cue from his behavior and ask that he send her away. "Othering" begets "othering" and the woman (and her daughter) are now discounted, put off. And yet, she does something no one else does in context with Jesus' teaching-even Jesus himself if we are to believe the testimony of the evangelist: She challenges the otherness that they have put upon her. 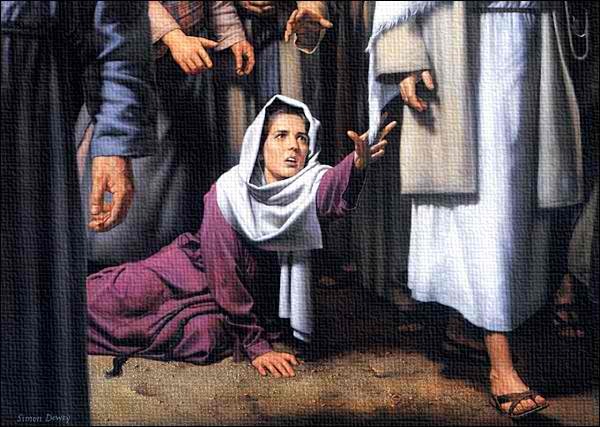 She engages Jesus. The result? One of the most shocking and dramatic teaching moments we see in Matthew when it comes to putting the Gospel into real practice. Jesus at first refuses to hear her plea, stating that he is there for the lost sheep of Israel and worse, that what he feeds them shouldn't be given to the dogs. "Even the dogs have access to the crumbs under the table," she ripostes. In almost every depiction of the Canaanite woman, she is shown as above. On her hands and knees, she reaches out to men just out of full view, out of reach. In the moment she responds to Jesus, though, I do not see her that way (if I ever did see her on her knees...). She stands, looks him in the eye and challenges him to keep his word and teaching, something she had in all likelihood been an invisible witness to just moments ago. "Even the dogs..."
I am always shocked by Jesus' apparent insensitivity in this story. I am also, always, moved and provoked by the woman's response to her dismissal. SHE is the one who breaks through the judgments and prejudices of the disciples, and Jesus himself is also upbraided for his momentary rejection of her right to ask for help. If Jesus can awaken us to our own tendencies to "other" people by this dramatic teaching moment, then there is perhaps hope for us. It isn't easy, as we are able to find myriad ways to make an other of people who God gives us to forge the wider Body of Christ that is the inbreaking Kingdom of God. It's more than just clean hands, or the right accent, or the right anything. It is a willingness to see not the "other" in someone, but rather to see someone who is redeemed and beloved of the same God who has made and saved us all. Woman, great is your faith!